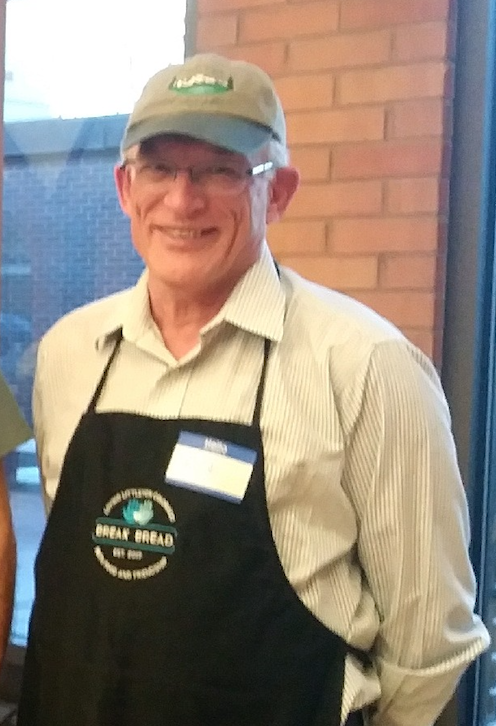 There is a saying that “Bob’s your uncle,” but at Break Bread, Bob might be your greeter, or a server, or a kitchen helper, or a neighborhood diner. So many Bobs abound at Break Bread! Here is Bob McVeigh’s story! One night a mom of a teenager who is differently-abled and I talked as they were leaving after their meal. She shared that she doesn't come for the meal but for the fellowship. She is very grateful for the opportunity to socialize "with such a loving and Christian* community." She teared up which led to my eyes watering up as well. Needless to say, it was a special moment. There are several senior citizens who participate in the Break Bread meals on a regular basis. Several are friends who live in apartments nearby. A few are named Bob —- which happens to also be my name. We joke back and forth about liking each other’s names, and one night we took a “Bob” group picture. We also regularly serve people who are currently living on the street. Like other guests, they are coming for more than the food. It is nice for them to get out of the weather, both hot and cold. So many of our regular diners are forming relationships with Break Bread volunteers and each other. These are some of our most appreciative neighbors. The fun is not knowing what new special moment is going to happen next. * NOTE: While Break Bread meals are served in the building of a lovely church, Break Bread is not a religious organization. Yet, many people do feel that Break Bread meals provide a spiritually supportive environment.